Angels Camp, CA...CAMPS Restaurant at Greenhorn Creek is your destination for award-winning fine dining in the Mother Lode. Featuring an eclectic, elegant menu of seasonally changing cuisine inspired by the tastes of Northern California, CAMPS proudly serves ranch-raised, corn-fed USDA Calaveras County beef, locally grown produce, and a carefully curated selection of local wines provided by our nationally recognized Vintner Members. CAMPS is the perfect place for everything from a relaxed lunch and beer when you come off the course, to cocktails and an elegant dinner, to special events and celebrations, including weddings, birthdays, and anniversary dinners. Browse our sample menus, learn more about our award-winning restaurant's legacy, and look at what we can offer for weddings and other special celebrations. 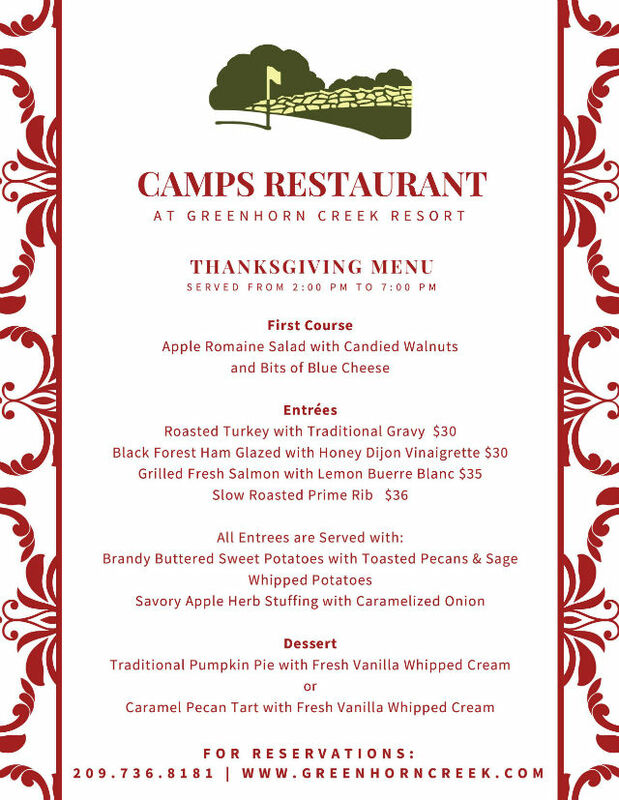 We look forward to welcoming you to CAMPS Restaurant!